Star Wars makes everything better. 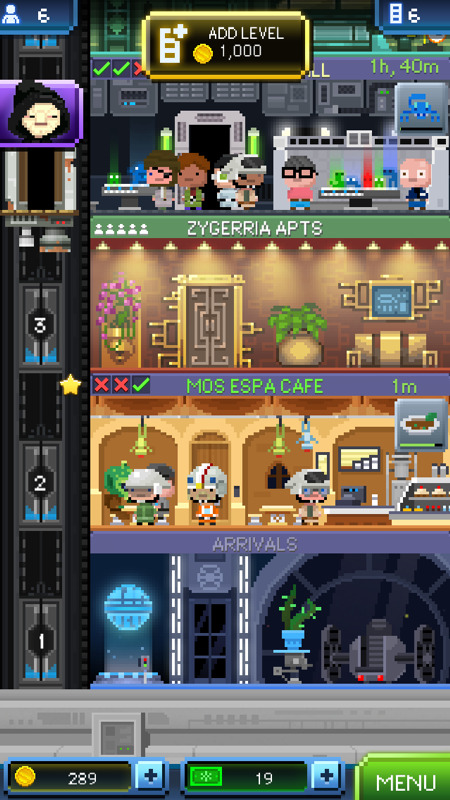 Tiny Death Star is the newest game from NimbleBit. If you liked Tiny Tower, then you should like Tiny Death Star. Darth Vader and the Emperor need money to build the largest Death Star. The game plays just like Tiny Tower, but everything has been given a Star Wars feel. Holographic menus, floors are all given names from the Star Wars universe. I’ve played Tiny Tower quite a bit since it’s been released. I made it to 89 floors. Now that there is a Star Wars version, I doubt I’ll be playing plain Tiny Towers anymore. Yes, Tiny Death Star is a freemium game, but its made in the usual NimbleBits fashion, and its easily playable without purchasing any IAP.